How I praise God for our prayer warriors! Steve slept a good 12 hours last night and woke up feeling significantly improved today. He felt so rough yesterday evening and sometimes in the night, that I thought I might be teaching on my own today — I’m so thankful that wasn’t true! Thank you all for your faithful prayers — it feels like you are right here with us! As we left the house today we remembered that Liva, the Academic Dean at BPI, had shared with us that today is her ‘Name Day.’ Each day of the year has 4 or 5 names on it that are celebrated on that day usually at work and sometimes at home. The person whose name is celebrated brings cake or treats to share with everyone, so Liva brought us all a yummy blueberry/chocolate layered cake. 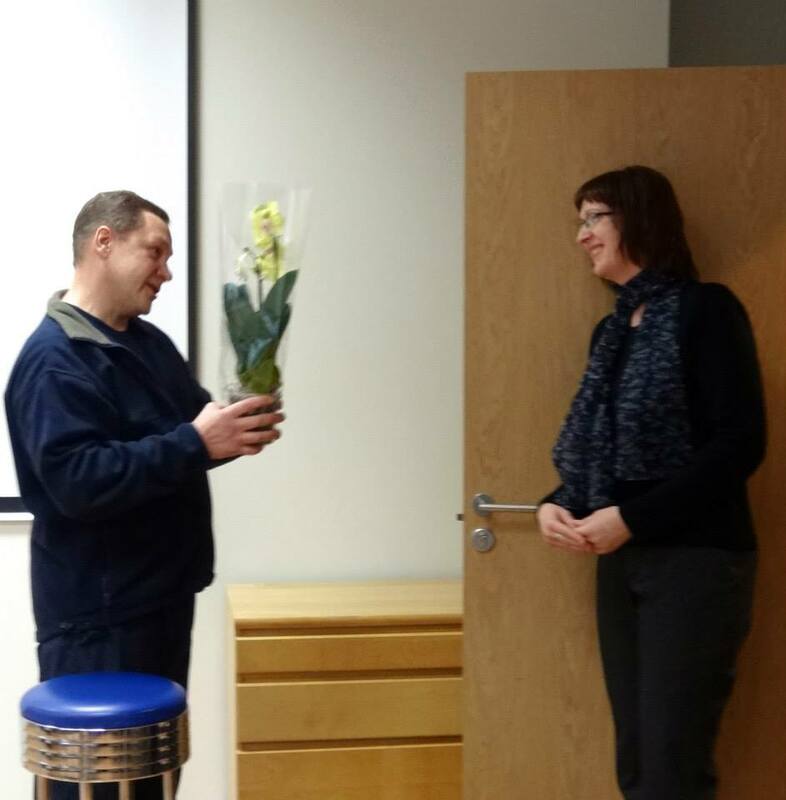 Chuck told us that it is appropriate to bring flowers or small sweets to the person celebrating their name day. We picked up some beautiful tangerine colored tulips for Liva and the guys brought her an orchid. Chuck made sure we knew no even numbers of flowers and no white flowers because that is what you send for a funeral. It is so helpful to have someone who knows the culture to give you hints! We finished our time of teaching at BPI with a lesson from me this morning on Transformational Ministry & Marriage and Family Ministry, Steve teaching on The Importance of Staying Faithful During Hard Times, and a time of questions from the men of BPI. It was an enjoyable day of hearing the hearts of these young men for the Lord and for the people of Latvia. At the end of the day they presented us with some yummy looking Latvian sweets and abundant thanks for our time with them. We got some pictures with them and also with our interpreter Vesma and then we said goodbye until we meet again. Happily I will get to see Vesma again on Saturday as I have opportunity to meet the wives and fiancees of these men and speak encouragement into their lives. I can’t wait! I know, I know – there are plenty of pictures of Steve teaching, He’s just SO handsome! Steve and Me with the BPI men. I’d claim them as my sons or brothers — all friends! Juris, the Prayer Warrior, presents us a gift of sweets to say thank you. I took a few more pictures on our walk home from BPI today. The transit system here is pretty amazing. We haven’t had need to use it because most of what we do is easily walkable, and when needed people have given us rides. A lot of people walk, a lot of people drive, but there is also an electric tram system, a bus system, and a rail system. I don’t have pictures of the rail system, but you can see the bus and tram. It all seems quite efficient and moves a lot of people safely and quickly. As we walked home there was a new little statue where there had not previously been a statue. I realized that this was a man, actually not far from where the opera singer had been plying his trade earlier in the week. 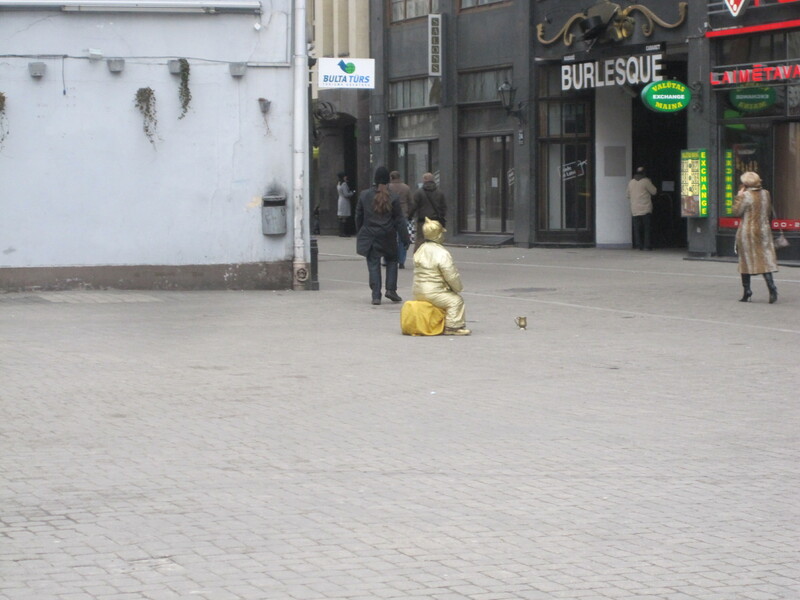 People find very creative ways to make a little money here from our opera singer, to a man who stands in one of the parks we walk through each morning playing his trumpet (yesterday we heard “Mack the Knife”), to this man posing as a statue and to a ‘grandma’ who sits on the street in the cold playing her tambourine. I know times have been tough here — when we went through the crash in 2008, Latvia did too and was even harder hit. Times are looking up a bit, but it is still hard to find a good job. Please pray Jeremiah 29:7 prayers for the peace and prosperity of Riga and of Latvia in general. Pray that God’s Word would spread in power. Pray for these young men and women who have a deep heart for Latvia and some pretty insurmountable challenges in front of them. God is able and they need heart and encouragement as they enter ministry. Today there was a new statue where there was no statue before. People find very interesting ways to make money here. Thank you again for you prayers. Steve teaches Bible Study tonight at Matthews Church, so your continued prayers are appreciated. Tomorrow night I speak to the ladies of Matthews Church and then on Saturday afternoon I get to speak to the wives and finacees of the men of BPI. We praise God upon every remembrance of you!